The Ham United Group have asked our friends at The Turning Hub to lead a ride for them this Sunday. 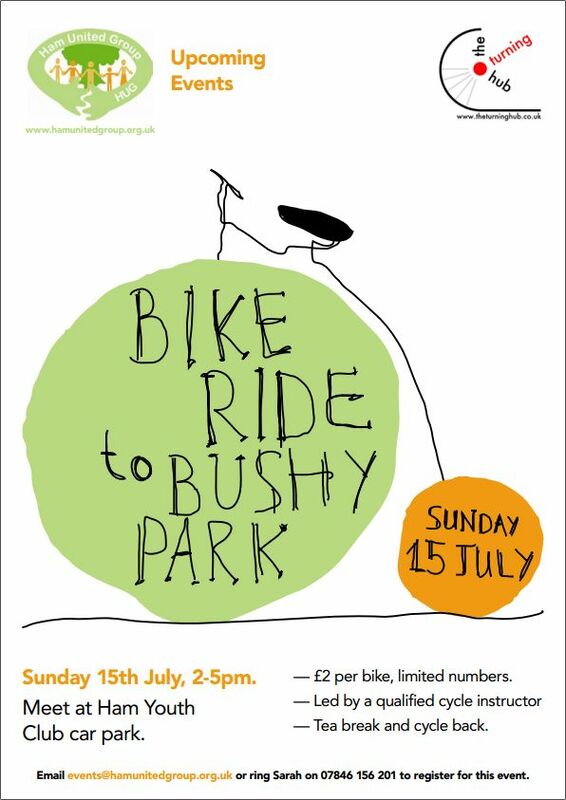 Meet outside the Ham Youth Centre on Ham Close at 14:00 for an easy ride to Bushy Park for a tea stop then home. Almost all of the ride is on towpaths or cycle lanes. Contact HUG to register for the ride via event@hamunitedgroup.org.uk or call 07846 156 201. Money raised from the ride goes to HUG’s community work. If you think your bike needs a check up or has a puncture or needs things adjusting, come along to the maintenance workshop at the youth centre the day before from 10-12 or visit the KCafe workshop from 3-5pm. This entry was posted in Events, Rides, Rides For Everyone and tagged Ham, HUG, The Turning Hub by admin. Bookmark the permalink.